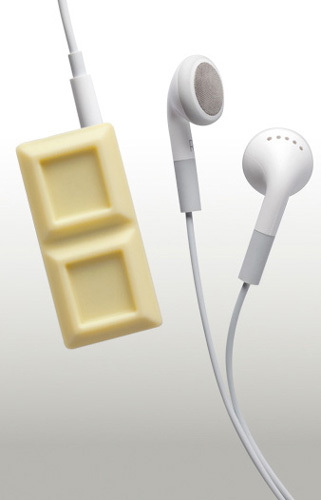 At first glance I figured this was some chocolate themed MP3 player, but as it turns out it’s not. It’s actually merely a disguise to make your brand new iPod Shuffle look like a cheap MP3 player. Thankfully, cheap MP3 players aren’t quite as desirable to steal as iPods tend to be. It also has no need to leave space for controls, so there are absolutely no outside markings for others to figure out that an iPod is concealed underneath. It leaves space so that you can still clip your iPod to your shirt, or wherever else you prefer to clip it. It also has an opening to make sure that you can plug in your earbuds as well as charge your iPod without having to take off the case. This chocolate case comes in three different flavors, white chocolate, milk chocolate and I’m guessing a strawberry chocolate. Either way though, there’s a pink chocolate option. The case won’t cost you much, which is nice since you’re just covering an extremely tiny gadget. You can purchase a case for $8.99 from SwitchEasy.